Stream Live TV Over WiFi With a Wireless TV Antenna! Hosting for the first time? Helping a friend host at their house (so you don’t have to)? 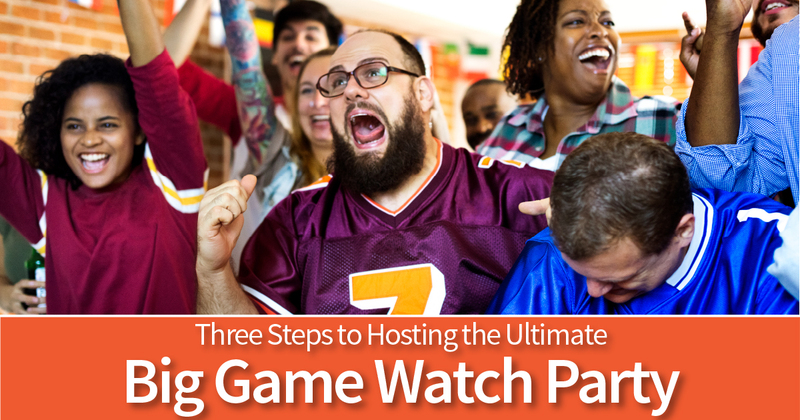 We’ve got some basic Game Day tips you can use as inspiration to make sure you have your bases covered (wrong game analogy, but you get it). If we’re being very honest, the food is one of the main reasons people show up for a Big Game watch party. Aside from football, this specific Sunday has become quite well-known for being a food-oriented occasion. Whether you’re a football fan or not, the fantastic snacks are well worth dedicating one Sunday of the year to. From walking tacos, pigs in blankets and buffalo chicken dip to wings, sliders and nachos, the list of easy gameday favorites goes on and on! Ask each of your guests to bring their favorite appetizer, set up a few favorites of your own, and your dining room spread will be sure to please. If you and your guests will be rooting for a specific team, you’ll probably use their official colors as the theme of your party. You can find all sorts of affordable, single-colored decorations and party supplies at a superstore, party store, or dollar store. A photo booth is also a surefire way to win your party guests over! People love a good photo opportunity with their friends on a fun occasion, and it’ll keep your watch party alive in their memories as one of the best for years to come. Pick up a streamer backdrop when you’re shopping for those color-coordinated supplies we mentioned. Add a football, a couple of whistles, a mouth guard or two, and any other fun props you can find, and snap away in your homemade photobooth during snack breaks! Best way to watch – an Antenna! Last, but certainly not least, watching the game with a TV antenna is the best way to enhance the game viewing experience for all. With an HDTV antenna from Antennas Direct, no need to worry about spotty resolution, losing signal during bad weather, or even muffled sound due to the crowds of people or loss of bandwidth. A TV antenna is definitely the best and most reliable choice when it comes to watching the Big Game, and we’re known for having the best indoor HDTV antennas available, as well as top-of-the-line outdoor options. The best part is you don’t need any subscriptions and there are absolutely no fees to watch! This year, you can be absolutely certain you won’t miss a single play, commercial, or crucial half-time show appearance. Cut the cord and catch the game with Antennas Direct. We’ve got your back.